36" Double Wide Electrohydraulic Scissor Lift Tables (120"W max) are double wide, high-capacity heavy duty electrohydraulic scissor lifts. They are designed for extremely heavy-duty lifting, from their structural strength to their high-power lifting ability. 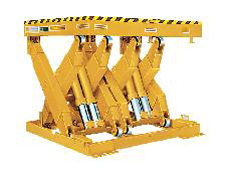 Rectangular structural tube scissor legs and torque tubes for maximum horizontal and longitudinal stability and minimal deflection. All controller components are UL and/or CSA approved. Specs: See table below.